have many multi-tools to choose from. Designed in collaboration with law enforcement personnel and first responders, Gerber's pared-down Bullrush Multitool fits the six most essential tools right at their fingertips. The partially-serrated tanto-style blade offers extreme piercing power and durability at the tip as well as a sharp cutting belly for slicing. The strap cutter easily cuts through seatbelts and webbing without injuring the wearer. It also includes full-size flathead and large Phillips screwdrivers, a pair of full-sized spring-loaded pliers that can be operated one-handed and a set of pinch wire cutters. All of the folding tools are accessible without having to open the multi-tool up, and a sturdy wedge lock prevents accidental closure during use. The ergonomic, G-10 handle offers a firm and easily-controllable grip. 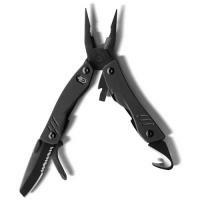 The tool is a matte black finished stainless steel, reducing reflection during stealthy operations. The Bullrush comes with a black ballistic nylon carrying case that mounts to a duty belt and fits in with other law enforcement equipment.